Congrats Ben. I'm very excited because of dev.to open source. Now, I'm reviewing the code base of dev.to. Thanks to all developers who contributed to dev.to. Most of the developer read dev.to articles. They improved themselves and I also improved myself thanks to dev.to. Yes! A full-loop. dev.to helping people code better so (among other things) they can help dev.to. An awesome virtuous cycle. Thanks Isaac, you've been an awesome supporter in helping us get to this point. I'm super happy and excited for the future of this community! I'm so excited to check out PWA practices in the code base. source project like DEV to learn from. Congrats Ben and everyone else! Thanks Meghan! I think you’ve got the most decorated profile of anyone in the community in terms of badges. Congratulations! This is a huge step! Chasing after after your GitHub star count! Think it's about time I learn Ruby, great work everyone! Congratulations guys and gals! So excited to be a part of this as it makes its rounds! Dev.to is going to continue to be THE space for breaking down barriers and being the legs to the table of the engineering community! Congrats team! Big milestone. Looking forward to making more contributions post-vacation. Nick, thank you for being an awesome DEV member and contributor! Anyone know how to get a PWA like dev.to? Congratulations, I was waiting for this day! Congrats team!!! I will learn ruby and this's really helpful for me ... Thanks you so much !!! Congats! Y'all been working hard on this! Congratulations Ben and the rest of the team! This is super exciting! Nice work Ben, Jess, Peter (& everyone else)! I saw dev.to using preact and i would like to know the reason behind it because i don't think size of React and ReactDOM would matter much on big app like dev.to as diffing and reactivity is not good compared to React. nice opening, this isn't the finish, it's the start, nailed it. I'm really excited to see what will happen with some OSS magic ! Congrats and Good luck! Open Source projects are awesome! Amazing! as a Ruby developer, I’m even more excited. Being an open source contributors is awesome.... I’m getting really inspired. Congrats on the big release (to the community)! Thank you for the trust and congratulations on the release! This is so exciting to see! Congrats, everyone! Congrats 🎉 Really love how detailed the general readme and contributing guidelines are! Do you have any API that we can use to build a costumed client app? sources have pretty good quality :) thank you for sharing! Congrats y’all. It takes big courage to put your product out there for the masses! Wow! 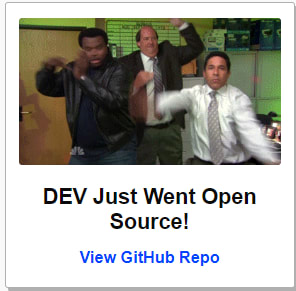 I love opensource communities a lot. It helps me to share, exchange, and benefit from others. Thank you. Congrats to the dev.to team! Keep making awesome things, now together. Wow that's really nice ! Thanks a lot ! This is so amazing! I love open source projects. dev.to is the most friendly, social, interactive and welcome place for developers. i find … too toxic and … too indifferent (not naming them particularly). What a great effort and thanks so much for contributing to the open source community! Awesome stuff! Great approach. Thanks for the free source code and the free stickers that I have received. Awesome work and amazing faith in the FOSS community. Opening up your hard work and dreams to a community can be a scary proposition. The Dev.to and friends have done an amazing job. Congratulations guys! Haven't been long in here, a month or so, but I already feel at home with all the awesome people in this community. Great work to all you guys! Congrats! I know this was a big undertaking. @ben I would like to help out with the development of the Android app. Can we discuss the approach you are willing to take for the native app? @ben , how do I see the number of posts views? Thanks. Yeah ! In FOSS We Trust ! I understand the choice, but always 💔😞 to see AGPL. Thanks, Sung! You've been a great member and I've really enjoyed reading your posts. You just had your one year DEV anniversary! It's because dev.to has been great to hang out on. You just had your one year DEV anniversary! It also an opportunity for RoR new comers (like myself) to learn from a real living application. Congratulations! Guys this is awesome.